Personality: Poodles are especially perceptive of their owner's mood. They quickly learn to recognize your voice and mood and act accordingly. If a poodle does something that the owner finds amusing and responds positively with a laugh or praise the poodle will interpret this response and repeat the behavior in the future. Temperament: Poodles are extremely intelligent dogs. They are happy and amusing dogs that will provide you with hours of joy and entertainment. Physical Ability: Poodles are amazingly agile dogs. They have the ability to stand on their back legs, climb ladders or ramps, dance and perform many other feats that other breeds cannot. Appearance: Poodles are squarely built and well proportioned dogs that carry themselves proudly. Size: The size of a Poodle depends on its classification. Standard Poodles are over 15 inches tall and weigh between 45 to 70 pounds. The Miniature Poodle will be around 11 to 15 inches tall, weighing between 15 to 17 pounds. While the smallest of the Poodles, the Toy Poodle is less than 10 inches tall and weighs between 6 to 9 pounds. Head: Poodles have very dark oval eyes that are set far apart and help create the Poodles alert and intelligent expression. Poodles' ears hang close to their head at or slightly below eye level. The skull of the Poodle is moderately rounded with flat cheekbones. Poodles have long, straight muzzle with a slight chiseling under their eyes. Their teeth should be white, string and have a scissor bite. Body: The length of the Poodle's body from the breastbone to the base of their tail should be approximately the same as their height to the highest point of their shoulders. Poodles have a long neck allowing their head to be carried in a high, proud position. Poodles have strong, muscular shoulders. The topline of the Poodle is level, with a slight hollow just behind the shoulder. Their tail should be docked at a long enough length to ensure a balanced outline. The front legs of the Poodle should be parallel when looking from the front and may have their dewclaws removed. The back legs should also be parallel when view from the rear. Their feet are small, oval and facing directly forward, neither turning in or out. Poodles have an effortless looking, straightforward trot with their head and tail carried upward. Color: Poodle standard colors are Black, White and Dark Brown. They can however come in many other colors including: cream, cafe-au-lait, light apricot, dark apricot, chocolate brown, gray or silver. Poodles generally have a solid even colored coat except for blues, grays, silvers, browns, apricots, cafe-au-laits and creams which may have varying shades throughout the coat. Poodles with brown or cafe-au-lait coats should have liver colored noses, lips and eye rims, dark toenails and dark eyes. Poodles with black, blue, gray, silver, cream, and white coats have black noses, lips and eye rims, black or self colored toenails and very dark eyes. Coat: Poodles have a curly, dense, harshly textured coat. There are several different clips that are standard for the Poodle. All the clips consist of face, throat, feet and base of the tail shaved with a pompon on the end of the tail. For poodles under 12 months of age the puppy clip is the standard cut in which the rest of the hair is left longer. In the English Saddle clip the front legs are shaved except for puffs left on the lower part of the leg and the hindquarters have a thin layer of hair except for a curved area on each flank and hind leg which are shaved. In the Continental clip the hindquarters are shaved with pompons left on each of the hips and the legs are shaved leaving a puff just above the feet. In the Sporting clip a cap is left on the head with the rest of the hair cut along the outline of the body. Life Expectancy: Poodles generally live to be between 12 to 15 years of age. 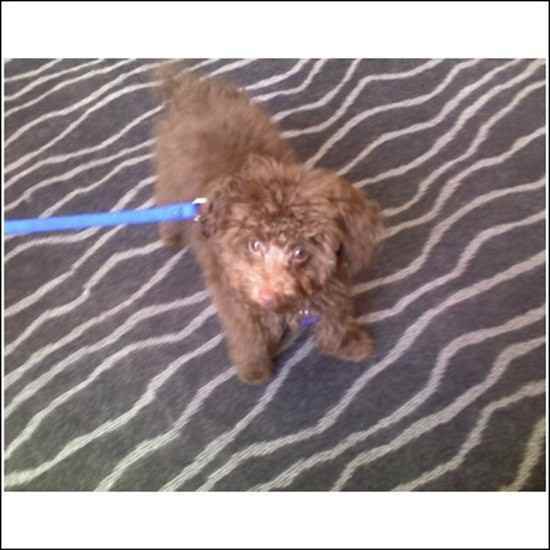 Characteristics: Toy - A poodle 10 inches or less at the shoulder is considered a Toy Poodle. Toy poodles make very good alarm dogs as they are always aware of their surroundings. They are well-suited to travel with their owners because of their size. They are usually permitted to travel alongside their owners on planes, trains and ships instead of in cargo like larger animals. Toy poodles can also be paper trained so their owners do not have to take them outdoors. This makes them a better choice for owners who have to be gone longer hours for work and cannot always come home during the day to let them outside. Toy poodles also do very well indoors without a large need for outdoor exercise. Miniature - A poodle 10 to 15 inches at the shoulder is considered a Miniature Poodle. Miniature poodles are active, agile and very alert dogs. They are very curious by nature and love to investigate their surroundings. They love to please their owners always seeking praise from people around them. They make very good alarm dogs as they are always checking out their surroundings for strangers and will surely let you know when one approaches. Because of their small size the do well in smaller houses and apartments and are well-suited for travel with their owners. Standard - A poodle more than 15 inches at the shoulder is considered a Standard Poodle. Standard poodles are known for their devotion to their owners, love of learning, sense of humor, and confidence. Their size and deep barks make them very good guard dogs for your home. Standard poodles are good family dogs and can do well with young children when they properly trained and brought up with children around. They are also large enough to not get hurt by small children who are quite sure yet how to treat a dog. Health: Bloat or Stomach Torsion is a condition where the stomach flips over and becomes filled with air, which releases toxins into the blood stream. If this happens medical help is required immediately as this is fatal. Cushing's Syndrome is a pituitary disorder where the body produces an excess of cortisone. This can be treated. Hypothyroidism is a hormone problem which is usually found in older dogs. This can be treated by your vet. Patent Ductus Heart Disease is a genetic congenital heart defect that requires surgery. Epilepsy is a disorder where the dog has brain seizures. This can be controlled with proper medication. Von Willebrand's Disease is another genetic disorder characterized by a low clotting factor in the blood. Skin Health: Poodles can have Atopic Dermatitis which is an unusual or atypical condition of the skin. Sebaceous Adenitis is an inflammatory damage to the hair follicles and sebaceous glands. This is a hereditary condition that normally affects Standard Poodles, but can also affect Miniature and Toy Poodles. There is currently no cure, but there are treatments including frequent bathing. Seborrhea is an abnormal, excessive discharge from the sebaceous glands which must be treated medically. Eye Health: Poodles may have Cataracts which is a cloudiness or film over the lens of the eye. This condition can be hereditary. You should check the health of the parents before buying your puppy. Glaucoma is another hereditary concern when choosing a Poodle. Glaucoma is caused by an increase in the fluid pressure within the eye. It is the leading cause of blindness in poodles. Miniature Poodles are prone to narrow-angle glaucoma which requires surgery. Progressive Retinal Atrophy (PRA) refers to inherited eye disorders affecting the retina. Night blindness is usually the first sign of trouble. Other concerns are Corneal Dystrophy, Congenital Night Blindness, Entropion and Tear Duct Anomalies. Bone Health: Cruciate Ligament injury is caused when the ligaments in the rear leg of the dog is crossed diagonally. This condition must be correct by surgery and is very painful for the dog. Elbow Dysplasia (osteochondrosis) is a genetic disorder mostly found in younger, growing poodles. This can be found in dogs that are allowed to exercise too much. Hip Dysplasia is another genetic disorder similar to Elbow Dysplasia, where the head of the femur does not fit properly into the hip joint. Legg-Calve-Perthes is another disorder which affects the hips of the dog. It causes lameness and pain in the leg and requires surgery to correct. Kneecap Dislocation (Patellar Luxation) is another genetic disorder caused by the kneecap slipping out of place. This is most common in small dogs. It may be corrected by therapy, but may require surgery. History: Ancestry - It is believed that the Poodle was created by blending The White Maltese Dog and the Spaniel. Origin of Breed - There are drawings and carvings of Poodles dating back to the Middle Ages. In more recent times Germany, Russia and France all have some claim to the Poodle beginnings. Each country bred their own characteristics into the Poodle depending on their needs. German Poodles, or Pudels, as they were known, were bred to retrieve fallen game. The Russian Poodle was bred as a companion dog. French Poodles were more known for their elaborate grooming styles. Grooming Styles - During the middle ages, poodles were used to retrieve game for hunters. The 'Poodle Cut' as it is sometimes known came about during this era. Poodles would have trouble swimming to retrieve ducks & other game birds that fell into bodies of water. As a result of this hunters decided to cut off all of the unnecessary fur from the Poodle, which included their feet, face, tail and hindquarters leaving only the hair around their upper region to keep their organs warm during cold weather and in cold water. Size Variations - The Standard Poodle was the original size. The Miniature Poodle was first bred during the 16th to 18th centuries to be the 'ideal' pet because of its size. The Toy Poodle was bred soon after the Miniature Poodle to create a smaller size that could be carried around easily. The Ladies of France would carry this Poodle around in the sleeves of their Overcoats. Brought To America - The Poodle was first brought to America in 1887. Their popularity was very high from the beginning. By 1960 the Poodle had become the most popular breed registered by the AKC and have been in the top 10 ever since.